Multimedia Gold Mountain tells a universal story that is common to all immigrants everywhere! Actor/playwright David Yip holds a large fan upon which images are projected for his project “Gold Mountain.”- photo courtesy of Van East Cultural Centre. Gold Mountain will feature exciting multi-media technology in an interesting collaboration of Montreal’s Les Deux Mondes and Liverpool’s unitytheatre. Gold Mountain would be of interest to any immigrant group to any country, and the aspect of Chinese in Liverpool is an interesting twist, similar to the diversity of multiculturalism in Canada. Stories of the Chinese diaspora have much in common to the stories of the Italian, Irish, Indian and the Jewish diaspora to Canada, as well as the recent immigrants from Iran, Taiwan and Tibet. It is the “Telling of Our Stories” that made “My Big Fat Greek Wedding” or “Bend It Like Beckham” stories that related to all immigrants. But what makes Gold Mountain more interesting is the multi-media angle of a global story. It’s a new perspective of story telling with awesome use of modern technology. Canada is a country of immigrants, and so Gold Mountain will relate to all Canadians, wherever they came from. 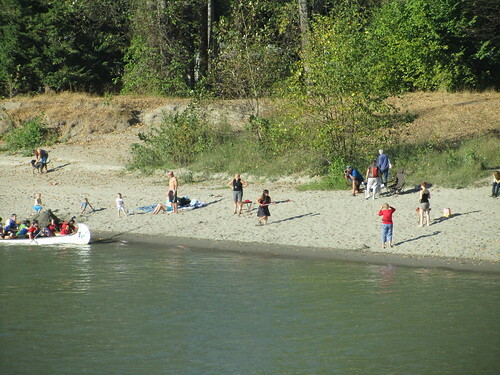 But maybe for this story, BCers and Vancouverites are especially interested because BC is seen as the Gold Mountain of Canada, as thousands of Chinese migrant workers came to Canada first seeking gold in 1851, then building the railway in the Fraser Canyon, and working in the coal mines of Vancouver Island. Presenting Asian-Canadian themed productions is a bit tricky in Vancouver. Many new Chinese immigrants really don’t seem to understand or care for stories about peasant immigrants in the 19th Century. Non-Asian-Canadians often aren’t interested in “ethnic stories”. But Joy Kogawa’s Obasan and Wayson Choy’s Jade Peony, are two of Canada ‘s most beloved novels. They have been emphasized that they tell Canadian stories, but are set in the Chinese and Japanese communities of Vancouver and BC. They also feature Canadian born characters, that explore what it means to be Canada. “Jade Peony” and “Obasan” are also close to my heart because I have been busy the past 10 years helping to promote them, and be involved in related projects, such as Vancouver Public Library’s One Book Once Vancouver featuring “Jade Peony”, and the “Save Joy Kogawa House” campaign in 2005. 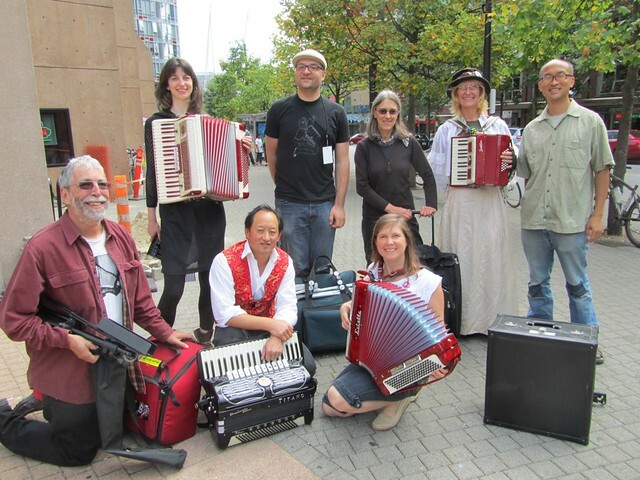 One of my favorites was the 2010 Mortal Coil production of “Salmon Row” that was performed in the Historic Britannia Shipyards at Steveston 2 summers ago, and the 2005 “Naomi’s Road” performed by the Vancouver Opera Touring Ensemble. This is a mini-opera based on the children’s novel version of Obasan, which is again touring BC for their 2012-2013 season. Wayson Choy Tribute dinner was an intimate and uplifting dinner event! The celebration of Wayson Choy and his novel “Jade Peony” was the cause for many of Vancouver’s literary luminaries to come together in Vancouver Chinatown’s Floata Restaurant on Sunday evening, October 14th. 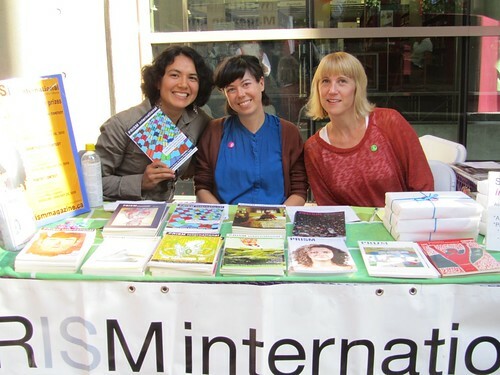 The event was presented by Asian Canadian Writers’ Workshop, Gung Haggis Fat Choy, Historic Joy Kogawa House Society, and Vancouver Asian Heritage Month Society. Project Bookmarks Canada founder Miranda Hill finally brought her project to the West Coast, after setting up 10 Bookmarks in Ontario. Anna Ling Kaye had assisted Miranda in scouting the site, along with other aspects of the project. When the site was finally confirmed by City of Vancouver, Anna brought the latest details to Asian Canadian Writers’ Workshop, where she is the current president. Immediately ACWW co-founder Jim Wong-Chu and vice-president Todd Wong agreed to organize a dinner, along with new board member Winnie Cheung. In four weeks time, 170 people gathered from many corners of Vancouver’s literary communities to celebrate. (Left to right) Author Lawrence Hill, Miranda Hill (creator of Project Bookmark), Wayson Choy, Anna Ling Kaye (president of the Asian Canadian Writers’ Workshop) and her husband Alex gathered for photos before the dinner. photo courtesy of Charlie Smith/Georgia Straight. The Georgia Straight wrote up both a preview story and posted pictures of the event. A total of 15 speakers graced the stage to share intimate stories of growing up as childhood friends of Wayson such as Garson, to fellow students during his time as the first Asian-Canadian in the UBC Creative Writing MA program. As well, industry representatives and community leaders also spoke including author/editor/community organizer Jim Wong-Chu, Vancouver Public Library Chief Librarian Sandra Singh, and BC Bookworld publisher and author Alan Twigg. 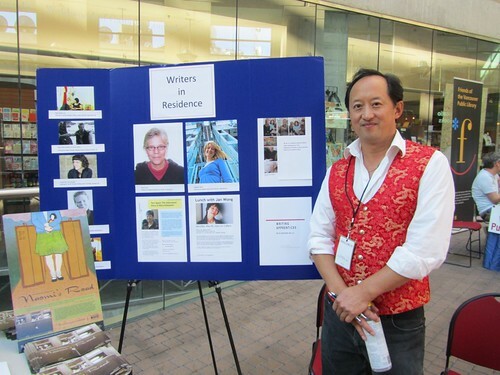 The evening was co-hosted by CBC Radio One broadcaster Sheryl Mackay who also hosts the CBC Radio One Bookclub, and Todd Wong creator of Gung Haggis Fat Choy, as well as president of Historic Joy Kogawa House and vice-president of Asian Canadian Writers’ Workshop – some of the events’ presenting organizations. Special Tribute Dinner to Wayson Choy, to help launch Project Bookmark Canada in Vancouver! I am very pleased to be part of the organizing committee for this very special dinner for Wayson Choy, author of The Jade Peony. It will be an incredible evening of insider stories about Wayson, as well as leaders from the literary community sharing insight and praise. It was my honour to get to know Wayson, when I was on the inaugural One Book One Vancouver committee for the Vancouver Public Library in 2002, as we encouraged the entire city to read Jade Peony, and discuss it with their neighbors, and attend related events. 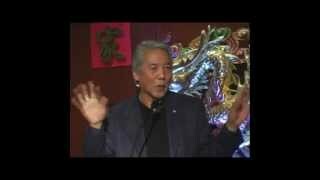 In 2004, Wayson gave the Bill Duthie address for the Vancouver Writers Festival, and in 2009 he gave the Multiculturalism lecture for the Laurier Institution – both were brilliant. 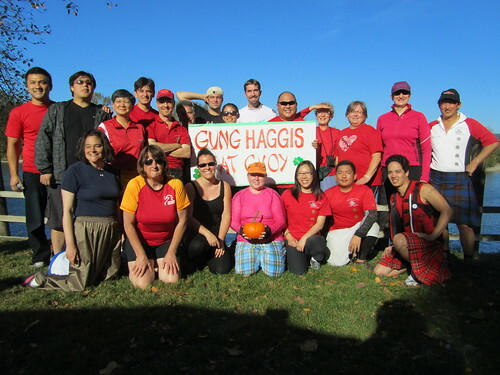 Gung Haggis Fat Choy teams at the Ft. Langley Cranberry Festival Canoe Regatta. It is one of our favorite events of the year, and the weather was with us. We have raced for about 10 years, and the last 5 years we have always entered two teams. 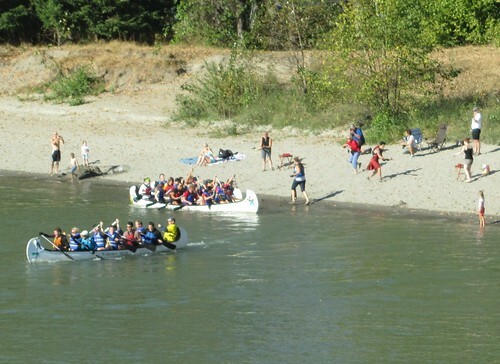 We initiated the Chili contest at the race to encourage teams to mingle, and ensure paddlers had hot food nearby. 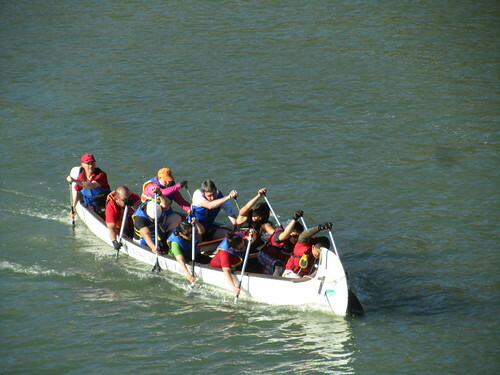 It’s so much fun, and we enjoy sharing our experience with our paddling friends. There were 20 teams entered and 3 final divisions. Gung Haggis See Yu was captained and steered by Todd and Harvey, came a very close 4th in C Final by a half second, and finished 14th in final standings. Gung Haggis Fam Lee was captained and steered by Karl and Xavier and finished 17th in final standings, while finishing 5th in the B Final. Sybil holds the pumpkin to drop in the first race. 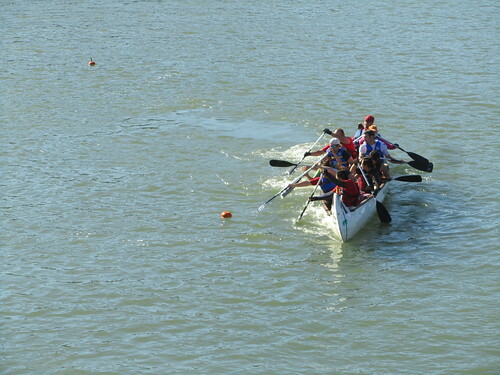 It was her first time in the Canoe Regatta. 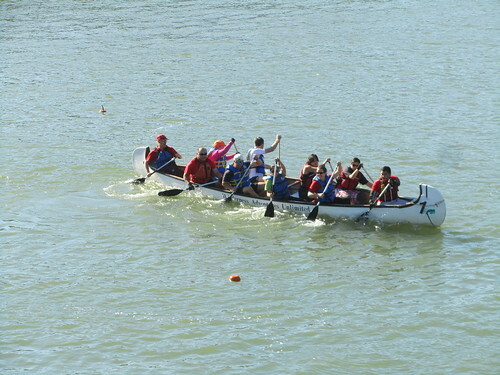 She joined our team for the Steveston Race, mid-summer. Harvey steered while Todd is lead stroke. 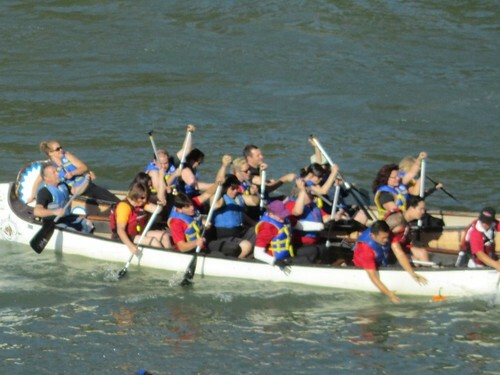 Good picture of our team as we race towards the bridge and finish line. Todd seat 1, seat 3 – Remus and Sean, 3 – Sabina and Reni, 4 – Christian and Johnny, 5 – Maggie and Liz. “Here little pumpkin… come to daddy!” Remus scoops the pumpkin with two hands, while another boat collides with us. Harvey did an excellent job of steering and blocking the other team from the pumpkin. We are a great lead stroke & steers combination, and switched positions for the 2nd race – just because… it was fun! Sean wearing his red kilt, runs along the beach, balancing a glass of cranberry juice on his paddle, while Harvey had steered our boat inbetween another boat and it’s runner. 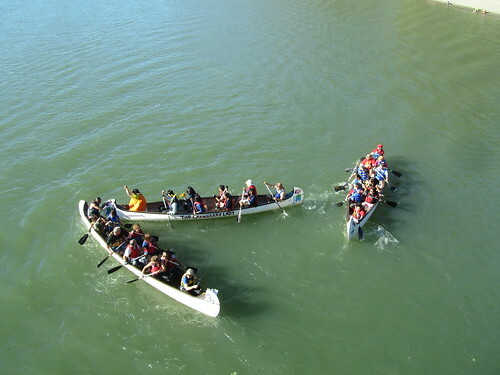 Great strategic move to cut them off… and delay their runner getting back in the boat. Xavier steers our other team with Karl in seat 1, seat 2 is Anne and Debbe, 3 – Thuy and Di, 4 – Florian and Nicolas, 5 – Stewart and Jenny. 3 boats in search of a pumpkin. 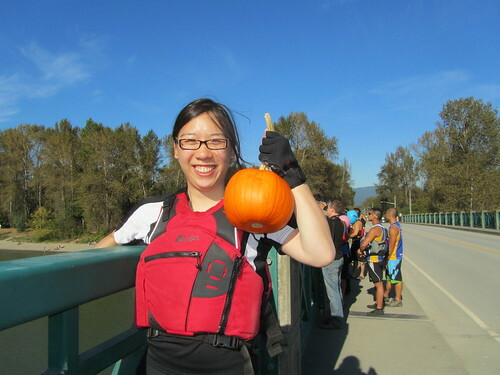 Unfortunately most of the boats headed to the North/Centre portion of the bridge, while most of the pumpkins dropped from the Centre South portion of the bridge. Lots of boat collisions and confusion. We shouted down at Xavier to go South to find pumpkins. Team Storm had their lead stroke Ray, dressed up as a pumpkin. 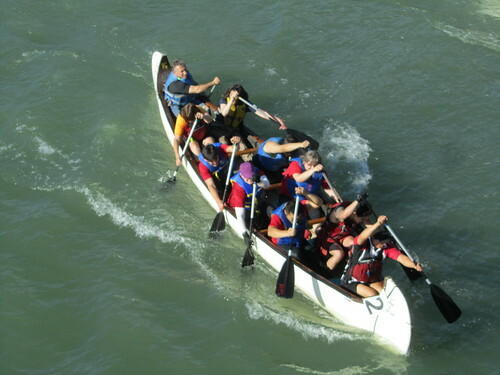 So close and yet so far… too bad voyageur canoes aren’t designed to be paddled sideways. Di was the beach runner for the team, and she chose to wear the knee-length blue Fraser Hunting Tartan. She did a great job climbing in and out of the boat, and balancing the cranberry juice on her paddle. If you get a chance, you should see this photo display. Its totally awesome. Its at Crystal Mall, 2nd floor, straight ahead when you come off the escalator – by Food Court and ends October 10th. The era is early 1900’s -1950’s or so…….maybe you know of some of the families like I did ……………the churches included in the display from that era are Chinese United, Chinese Presbyterian, Good Shepherd Mission, and Chinese Anglican…………wonderful display that also features some well known Chinese Canadians from that era……great pics…….lots of reading too…….. I am standing at the booth for Historic Joy Kogawa House – where I am president of the Historic Joy Kogawa House Society, and we now organize a writer-in-residence program, after we saved the childhood home of author Joy Kogawa in 2005. It’s always great to see friends at WOTS. 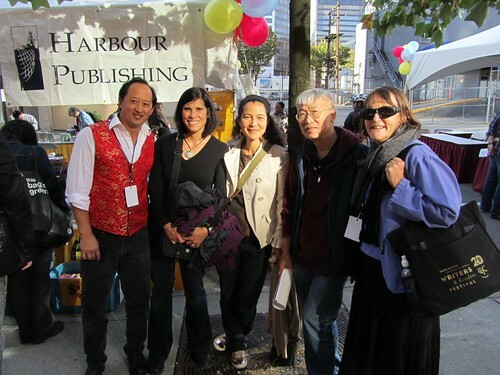 Here we have Todd Wong, Marisa Alps (Harbour Publishing), Emiko Morita (Douglas MacIntyre), Jim Wong-Chu (Asian Canadian Writers’ Workshop) and Angela McWhirter. 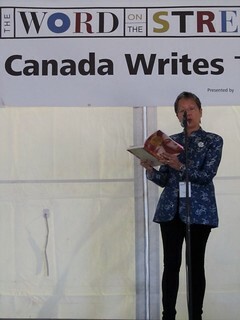 May Q. Wong reads her story from the Canada Writes stage. Anna Ling Kaye is also a literary editor for PRISM magazine, as well as president for Asian Canadian Writers’ Workshop. 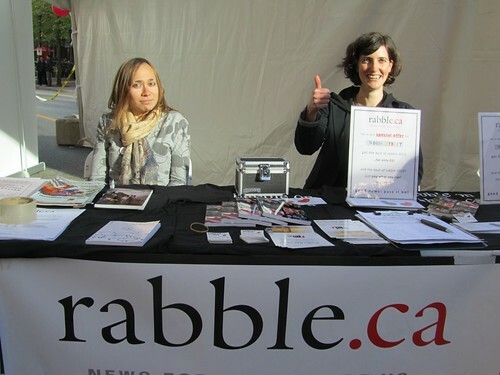 Editor Alex Samur gives us a thumbs up from the Rabble.ca booth. 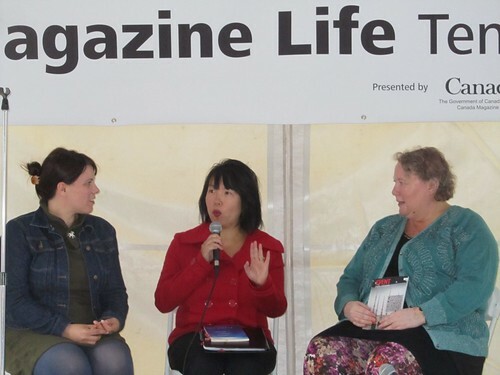 Elizabeth Balchinsky, editor of Event Magazine interviews Vancouver’s Poet Laureate Evelyn Lau and Creative Writing instructor Cathleen Witt. 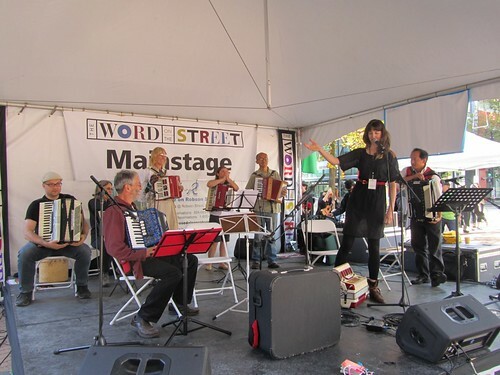 It was the first time performance of the Vancouver Squeezebox Circle at the Word on the Street Book & Magazine Fair, and we wanted to make it literary! 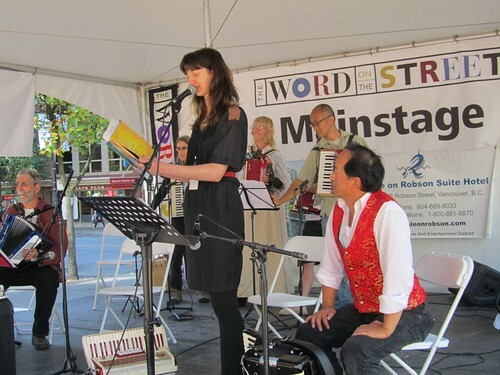 In between our solo and group songs, our co-MC’s Barbara Adler and Todd Wong read/described books that featured accordions – both adult fiction and children’s books. We read 2 stanzas from the Robert Service poem “Accordion”, we showed pictures from Jamie Lee Curtis’ children’s book “Is There Really A Human Race”, as well as “Mendel’s Accordion”, and “When Cats Go Wrong.” We closed by briefly describing the Annie Proulx novel “Accordion Crimes”, in which an Italian-made accordion travels across the Atlantic, lands in New Orleans, and soon finds itself playing Zydeco music, then German folk music, as it exchanges hands and cultural groups. Our repetoire opened with a Sousa March titled “The Liberty Bell” which is more known as “The Monty Python Song”. I performed the first solo, playing J.S. Bach’s Toccata in D Minor. Next we played the “Col. Bogey March” from the movie Bridge Over the River Kwai. 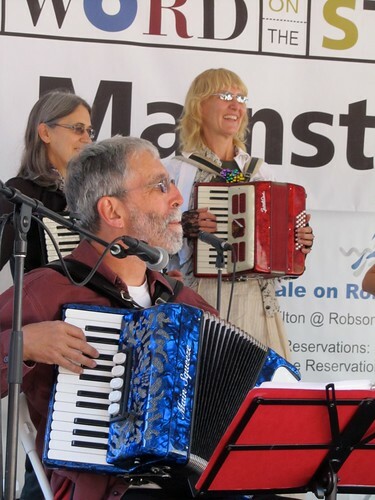 Alan Zisman played a Klezmer song, Barbara sang an original song she wrote, and we all played the Can Can from Orpheus in the Underworld to close.